Rivers State Governor, Nyesom Wike, has charged the state Independent Electoral Commission (RSIEC) to plan to conduct local government elections in May with a view to inaugurating elected officers of the councils on May 25. He also tasked RSIEC to conduct very credible and transparent elections. 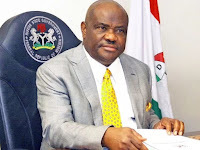 Speaking after swearing in six new members of the Rivers State Independent Electoral Commission (RSIEC) at the Government House Port Harcourt on Saturday, Wike urged the commission not to allow itself to be influenced by any political interest. He stated that the state government would release the funds appropriated by the state House of Assembly for the conduct of the local government elections to the commission. The governor said though the local councils are still subject of litigation, the issues would be resolved by May 25. Wike said in line with the amended RSIEC law that stipulates 90 days’ notice before the conduct of elections, RSIEC should commence the process for the conduct of local government elections. He said: “Show Nigerians that you can conduct credible elections into council offices. He said if the commission issues the notice for elections in February, by the first week of May elections would be held, setting the stage for elected council inauguration by May 25, 2018. The governor stated that he would never interfere in the workings of the RSIEC. He urged members of the commission to always work to uphold the law. The RSIEC members who were sworn-in by the governor include: Dr Reginald Amadi, Professor Jones M. Jaja, Rev. Innocent Karibo, Mrs Florence Amiesimaka, Mr Etete Festus and Prof. Ezioma Ekpete.